Leap for a 50% Discount! Enjoy 50% off your accommodation on Sunday 28th February at De Hoop Collection! Plus, we’ll treat you to a complimentary Eco Boat Cruise on Monday 29th February! 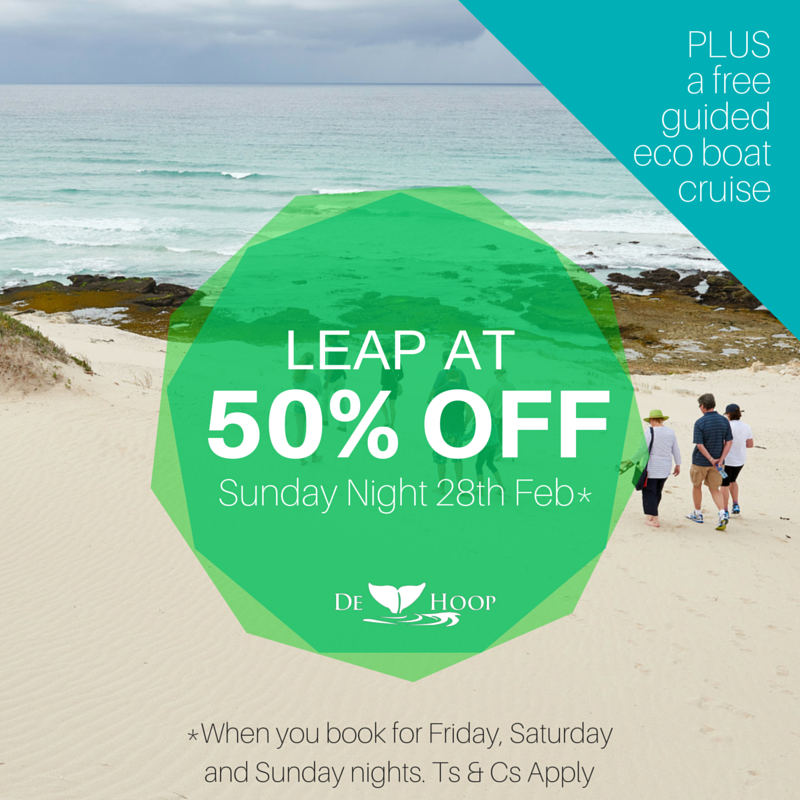 Quick, jump on this offer and celebrate the Leap Year with a discount and a cruise out at De Hoop Nature Reserve this month. BOOKINGS: Promotion not valid for previously confirmed bookings. Promotion is valid for bookings over leap weekend only for 3 nights (fri, sat & sun). Bookings will only be confirmed once payment is made. COMPLIMENTARY BOAT CRUISE: Complimentary boat cruise is only valid for Leap Year Promotion bookings on leap day morning. Boat Cruise is weather dependent and the reserve will arrange an alternative activity should the cruise be cancelled. Alternative activities will be subject to the decision of management. Boat cruise includes drinks and snacks.